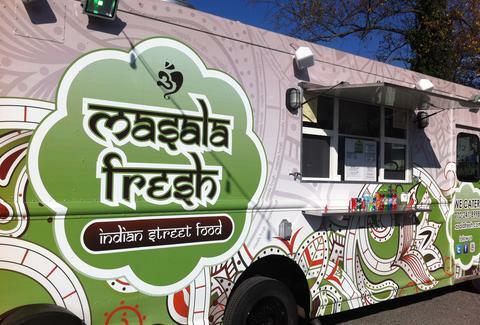 To ensure your Indian cuisine experiences are anything but Hydera-bad, Masala Fresh (named for the spice blend that's mixed into everything they serve) just started rolling as ATL's first all-Indian street food rig. Grab flaky samosas or super-spiced fries, then choose naan wrap or a jeera rice bowl (basically basmati flavored w/ cumin), select a masala-covered filler like creamy tomato-sauced chicken tikka or tender spiced lamb, and cover it all with mild "cool raita" (it's got cucumber, cilantro & yogurt, and wears sunglasses in clubs), medium "mellow mango" (not true, ask Matt Damon), or genuinely hot mint cilantro w/ green chiles. Soothe your burning face-hole with bottles of mango juice, and Indian sodas such as Limca (basically Sprite), and their version of Coke called Thums Up, which everyone in India gives to hilarious puns about their cities' names.